This recipe is from the October issue of Bon Appetite Magazine and just so happens to be a featured recipe from my best blogger bud Shelly Westerhausen! I thought there’s no better way to celebrate her and this awesome achievement than cook up her recipe (also it was one of the best looking recipes in the issue, if you ask me!). 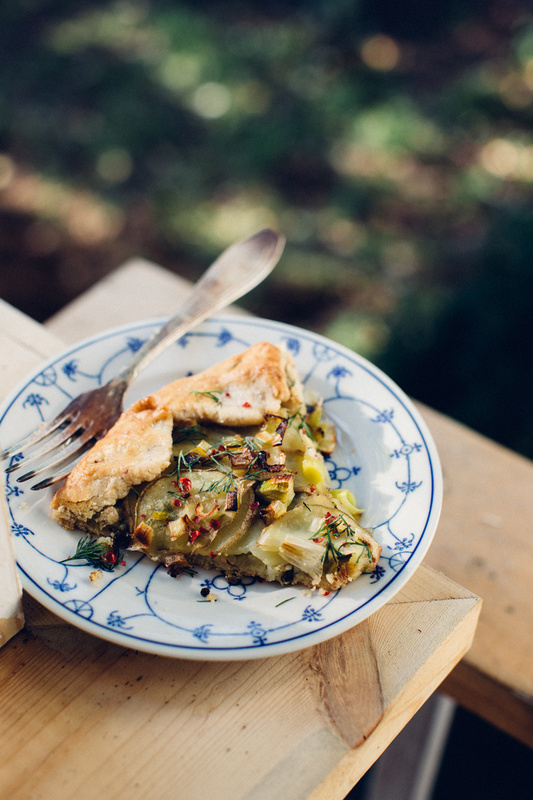 Shelly has her first cookbook coming out this spring and I can hardly contain my excitement! I’ve gotten many behind the scenes sneak peeks and I can tell you it’s going to be amazing/gorgeous/all that! 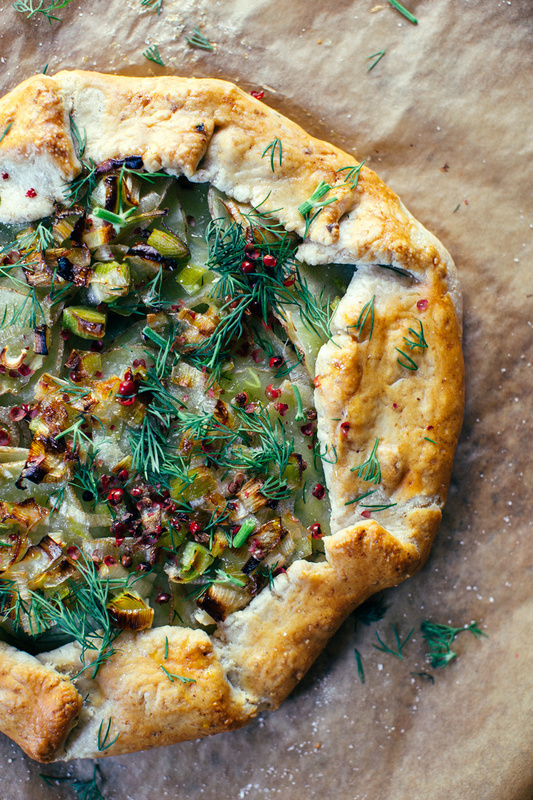 Shelly used pistachios in this crust but I had hazelnuts on hand so that’s what I used. 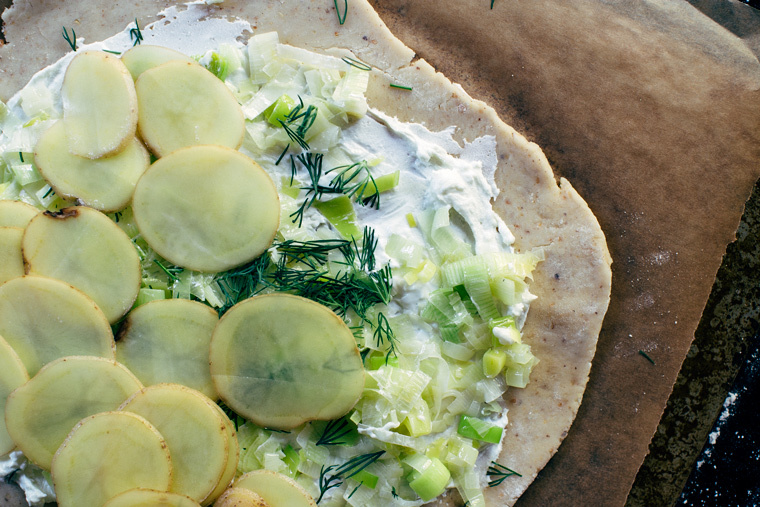 This galette is definitely on the list for savory eats at the baby shower, so good! Place the hazelnuts into the food processor and pulse until coarsely ground. Add all the dry ingredients and pulse to combine. Next add the butter and process until a coarse meal forms. Gradually stream in 1/2 cup cold water (I didn’t need quite all the water, just watch the dough, if it forms a ball you’re good). 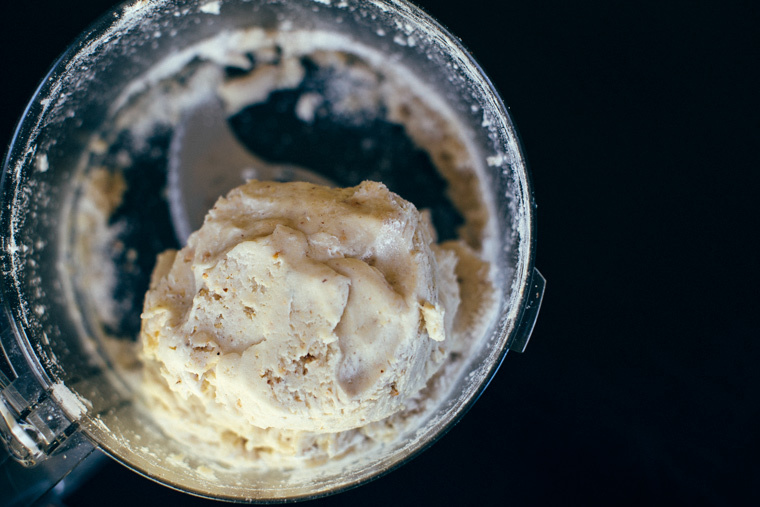 Form dough into a ball, then flatten into a disk and chill for at least 30 minutes. 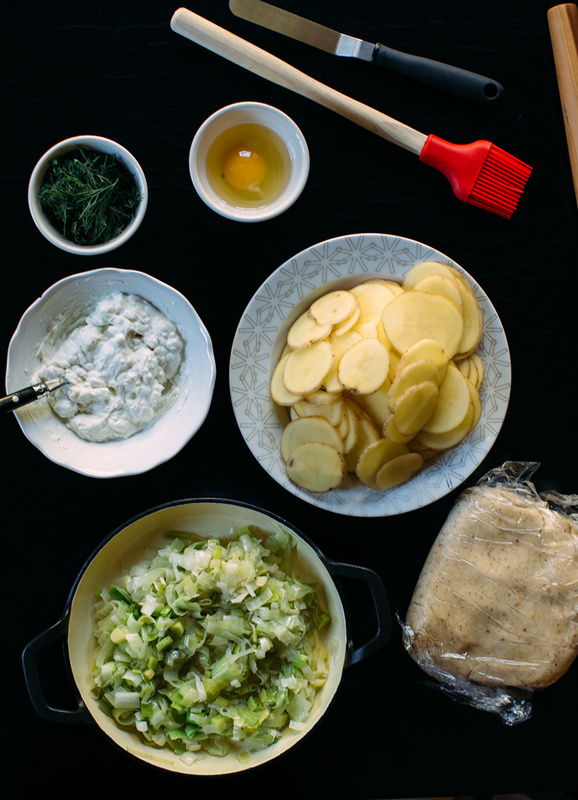 Prep all the ingredients: thinly slice the leeks and potatoes, I used a mandolin for this. Mince the garlic and whip it into the cream and got cheese, season with salt and pepper. Sauté the leeks in a small pan with olive oil until just turning translucent, not brown. Season leeks with a bit of salt and pepper. Preheat oven to 400F. I divided the dough into two equal parts to make two galettes. Roll out the dough on a clean, lightly floured surface, transfer to a baking sheet lined with parchment paper. Spread out the cheese mixture, as shown, leaving a 1 inch boarder. 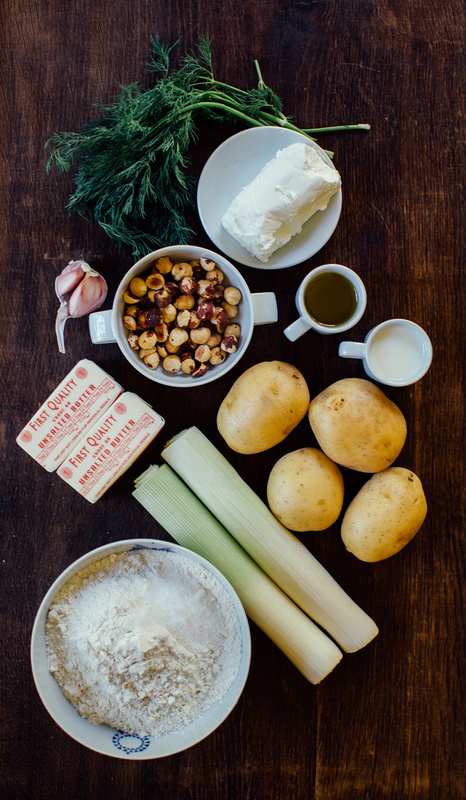 Scatter on some leeks and a bit of dill, then the potatoes, then some more leeks. Tuck the crust around itself in a circle, as shown. Brush the crust with egg wash for a shiny look. Bake for about 30 to 40 minutes or until just brown. 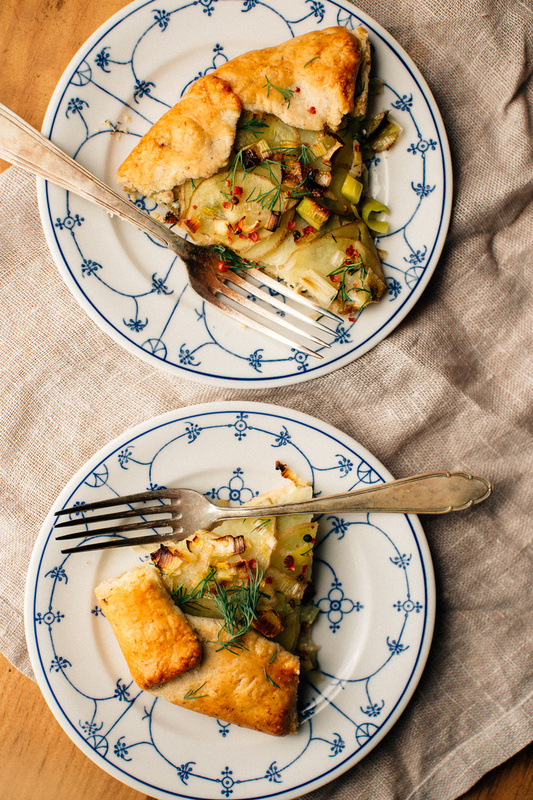 Drizzle with honey and top with dill and crushed pink peppercorns. Season with salt and black pepper. This hazelnut crust looks absolutely amazing and the filling too. 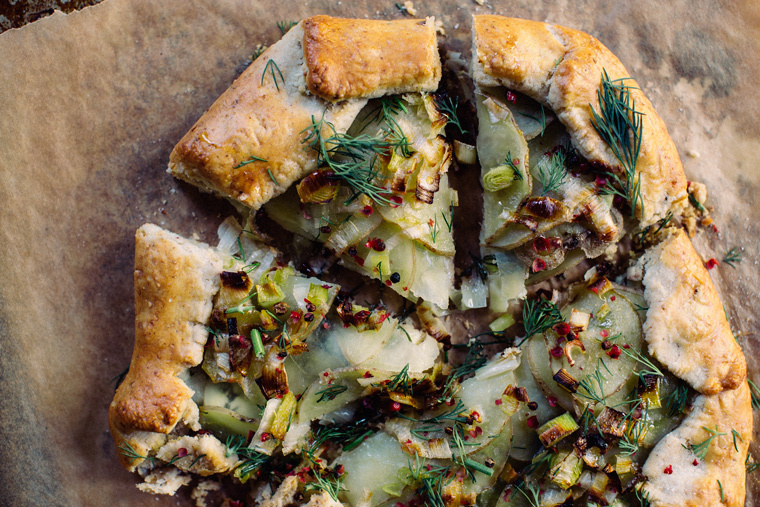 What a cool looking Leek and Potato Galette, friend! And the pictures are beautiful!